My ultimate goal was to get a “A” grade a the Yahoo! YSlow Firefox plug-in. Here are their rules: Best Practices for Speeding Up Your Web Site. All I can say is… I’ve reach this goal! I saw the post “Compresser et ranger son CSS avec PHP“, and decided to post the solution I use for the 2 projects I work on. You can get all the sources described and explained in this article here: minify_js.zip. To make this code works, some HTTP skills is required (404 error pages), PHP code is simple (only static methods are used). The only issue may be with the web server setup. As you’ll see below, you may need to modify the apache httpd.conf file (or IIS setup). The first step is to create minified JS sources. It will produce ‘.min.js’ files based upon the original ‘.js’ files. This is done via a custom makefile. In the PHP views, instead of writing <script> HTML tags, I call a kind of view’s helper (not really because it is a static call: works every where, and do not require the MVC model of Zend Framework to work. This “helper” queues JS scripts. When I want to print out the <script> HTML tags, I call the printer of the above class. Il will produce the minimum HTTP calls. 404 error are caught thanks to the ‘.htaccess’ file and rerouted to a PHP script that creates the aggregates files and sends it. On next calls it will be directly delivered by the web server, without any PHP computes. Instead of writing<script> HTML tags, you will use the “Ihm_Js::addScript()” wrapper (see lines 24~32 above). Once your list is complete, simply write out where you want (header or footer) with: “echo Ihm_Js::get();” (see line 40 above). 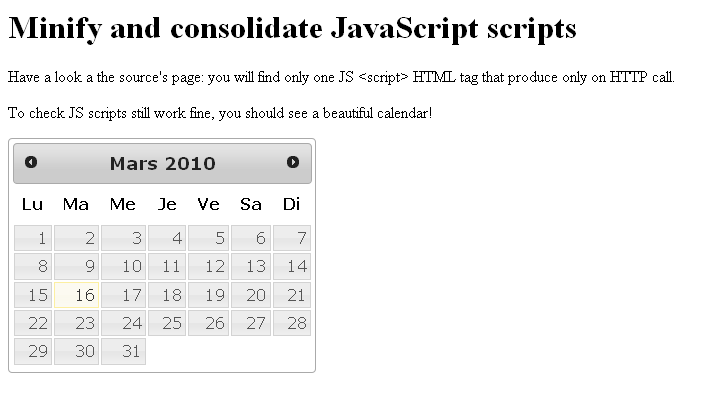 Have a look a the source's page: you will find only one JS <script> HTML tag that produce only on HTTP call. Simply check that you JS code is still correctly interpreted! Note: allow .htaccess makes a lot of I/O file accesses. It is recommanded to put the per folder setup directly in the main httpd.conf file (the last point I have to work on with production environment!). It will receive the scripts via the $_SERVER[“REDIRECT_URL”] variable. * This script is called by a 404 error page catched by the web server. Files are generated here : public/scripts/1.0.0.__REVISION__/. This last folder is given by the function Env::getVersion(Env::TEXT) described in the next tools section. Provide some environment’s informations, such as the version of the product that will be updated at each product release. Another information could be to know weather the current environment is production or not. If not, you may not want to write JS files. and use the current project’s version, so that you can take full advantages of the client’s web browsers’ cache. * Duped calls are not taken. To take full advantages of the web browsers’ cache, here is an extract of the apache setup I use in production. Use gzip compression the most you can. All web browsers now fully support it. You will save a huge internet bandwidth based on a minor CPU coast. You will notice some restrictions for images and old browsers. Get a unique ID for files, even with load balanced servers (do not use inode information!). Note: to get it working in load balanced environment, you need to deploy files via a zip or tar. So that modification dates will be the same on all your web servers. The expire information can be set by default for all static files (images, css and js files). The internet explorer will not try to get the file until it is not expired. # ExpiresByType image/gif "access plus 14 days"
the end-user experience is the (almost ;)) only goal with have! I hope this article will help you to get a faster web experience for your users. Feel free to ask me any questions/comments. This article is the result of many years of web projects I’ve worked on and still work on. Since Jul 21st, 2011, I am a Zend Certified Engineer. That looks very nice. Before that I’ve mainly focused on optimisations of php code in order to lighten charge on server. I now realize that an approach like that will also reduce number of requests on my server and so could partially solve overload problems. Really nice blog for learning php script and give information how to use php script and also java script.